Epson's innovative color-on-demand SecurColor inkjet printer offers fast, reliable printing for custom color-enhanced labels, wristbands, meal tickets and more on paper rolls up to 4.4 inches. It features Epson MicroPiezo® inkjet technology and prints at high speeds up to 3.7"/sec. • USB 2.0 or Ethernet interfaces. With SecurColor’s on-demand color printing, you can reduce operational risks, lower costs and improve customer service or patient care. Current label printing solutions such as pre-printed labels or blank label sheets used in desktop inkjet or laser printers are cumbersome, costly and susceptible to human error. 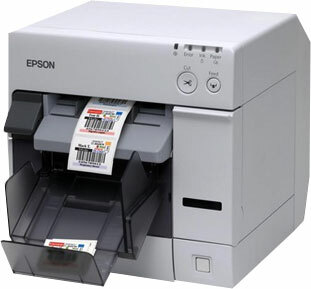 With Epson’s innovative color-on-demand SecurColor inkjet printer, you can print custom color-enhanced labels, wristbands, meal tickets and more with just a single printer, whenever you need them. And your system software assigns the right color code, reducing the risk of human error. Epson’s compact SecurColor printer features print speeds up to 3.7"/sec at a clear 360 x 180 dpi, easy drop-in paper loading of rolls up to 4.4 inches wide, autocutter, gap and black mark sensors and more. SecurColor features Epson’s patented MicroPiezo® inkjet technology, known worldwide for its quality and reliability. This ensures that SecurColor prints crisp, clear, easy-to-read graphics, bar codes and text every single time. In addition, SecurColor can print colorfast, waterproof labels without messy thermal transfer ribbons. "Gap" and "Black mark sensor"